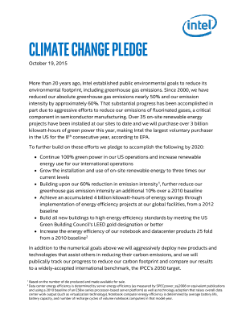 More than 20 years ago, Intel established public environmental goals to reduce its environmental footprint, including greenhouse gas emissions. Since 2000, we have reduced our absolute greenhouse gas emissions nearly 50% and our emission intensity by approximately 60%. That substantial progress has been accomplished in part due to aggressive efforts to reduce our emissions of fluorinated gases, a ...critical component in semiconductor manufacturing. Over 35 on-site renewable energy projects have been installed at our sites to date and we will purchase over 3 billion kilowatt-hours of green power this year, making Intel the largest voluntary purchaser in the US for the 8th consecutive year, according to EPA.